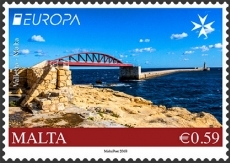 On 3 May 2018 Malta Post issued a set of two EUROPA stamps depicting bridges. The €0.59 stamp shows the Breakwater Bridge with St. Elmo Lighthouse at the end of the breakwater. The recently completed bridge replaces one destroyed during World War II and allows access to the breakwater and the lighthouse from land. This entry was posted in Lighthouses, Stamps and tagged Malta. Bookmark the permalink.